*Members Only Class- Book Here! Do you enjoy cooking and spending time at the spa? We are now offering both classes together. 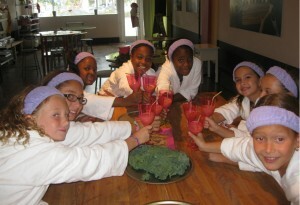 In this 2 hour class, our young girls will learn to prepare delicious and healthy treats, while being pampered at the spa! In the kitchen you’ll make Tropical Splash Smoothies, and pink (natural colored) Cupcakes. At the Spa you’ll enjoy a Homemade Honey Delight Facial, Organic Sugar Scrub, and a Strawberry Cream Mani with nail color. Then………just relax and enjoy your snacks! *This class has limited space. Drop off only please. Shh…. this class is for girls only.